I’m amazed when I open up the farm box and see a bunch of rainbow chard. The vivid jewel tones provoke an exclamation of nature-awe, “How did that happen?! ?” Like a stain glass window, the stems range from turmeric yellow to scarlet, tangerine, smokey plum and emerald. Not only did Mother Nature make it beautiful, she packed it with nutrients like vitamins A and K, iron, dietary fiber and phytochemicals. I wanted to treat my rainbow chard with the same deft elegance, and use it as a gift wrap for rustic Italian flavors. With a “root-to-stem” approach, I sautéed the chopped stems, which are similar in texture to celery, then I added in onion, garlic, pine nuts, capers and basil. The blanched leaves were to both cloak to keep the tilapia filet tender and add earthy flavor, in a deceptively simple way to get dinner on the table. Serve with steamed farro for a complete meal. Heat an oven to 350 degrees. Bring a stock pot filled with water to a boil. Add a generous pinch of salt and the rainbow chard leaves, blanching them for 1 minute, until slightly wilted. Drain on paper towels and set aside. 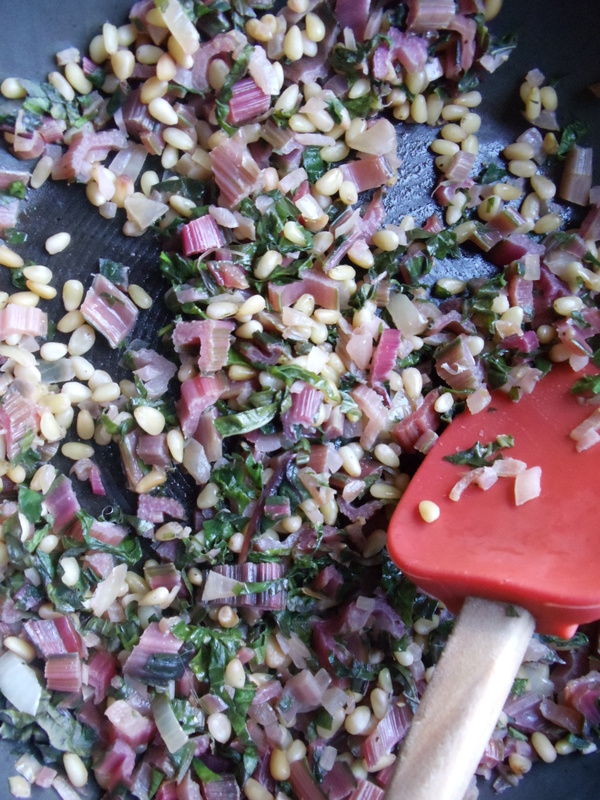 Heat a large skillet, then add the rainbow chard stems and onion. Cook until the vegetables soften, then add the garlic, and continue to cook until vegetables just begin to brown. Turn off the heat, stir in the pine nuts, basil and chile flakes, then season with salt. Season the tilapia with olive oil, salt and pepper. Place a filet on top of a rainbow chard leaf, then a quarter of the vegetable filling. Fold the sides of the chard leaf over the filet into a tight envelope. 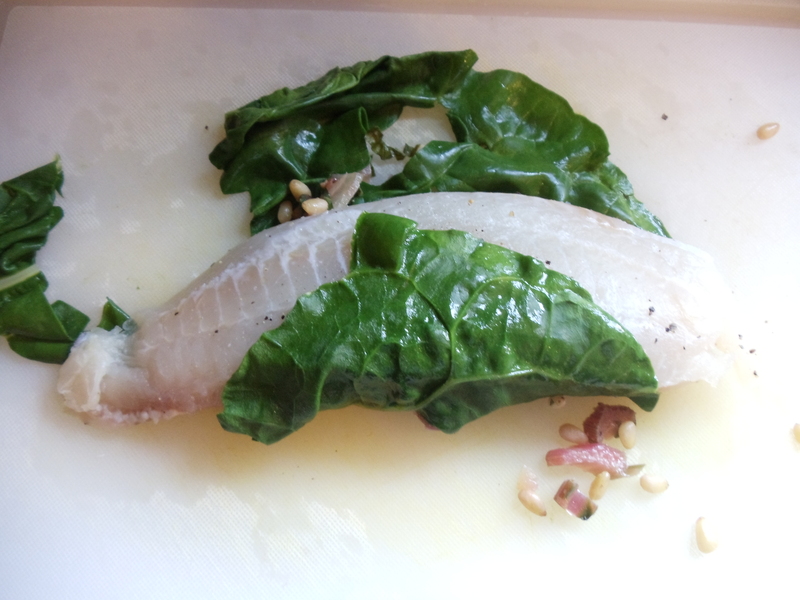 If the chard leaf does not cover the fish, then roll in a second leaf to cover. Continue with the remaining tilapia filets. 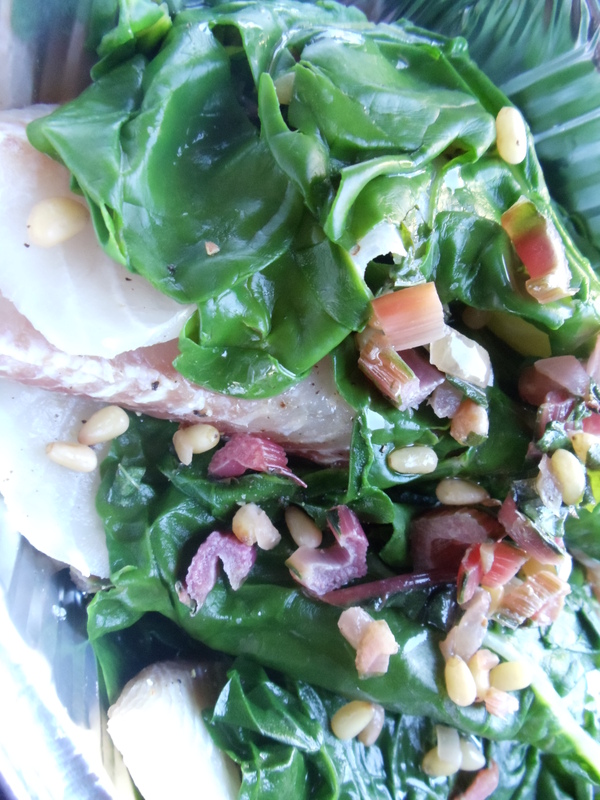 Drizzle olive oil on the bottom of a 9×13 glass baking dish, then place the chard-wrapped tilapia in the baking dish. Season lightly with salt and pepper, then cover the pan with aluminum foil. Bake in the oven for 20 minutes, until the the tip of a paring knife can easily pierce the tilapia, meeting no resistance. Serve immediately.